When we were wedding planning, I'm not sure how but I stumbled onto Adrian & Andrée Warnock's wedding vows. I printed them out and showed them to Lawrance. 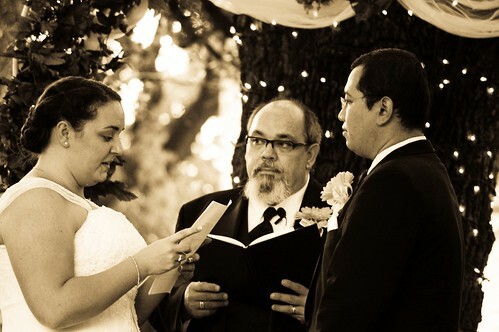 We both loved how much Scripture was in the vows. But, we also loved the vows that my dad had written . . . so we used both. Also, one of the engagement ceremonies I went to here in Taiwan had the future bride, future groom, and the future in-laws answer several questions in a row. I really liked that. To be asked lots of questions and then only answer with one simple "I do" . . . too easy. Also, I remembered my dad telling me after one of the many weddings he has officiated that brides and grooms are so excited and/or nervous (ie. just plain full of emotion), they don't really know grasp all that they are actually agreeing to. Refusing to be in that group, we paid careful attention to our vows. We probably discussed our vows more than anything during the beginning planning stages of our wedding. And, we also separated the questions, so each of us said "yes" several times. Speaking of the "yes." I told my dad when he was planning the ceremony that we wanted there to be a focus on grace, the sovereignty of God, and of the idea of a covenant. So, my dad changed the simple "I do" to " I do so covenant with the Lord and Amanda/Lawrance" (depending on the speaker). We loved that change! Dad: Do you Amanda Nicole Parmley, in the presence of Lord and all who are present here, promise and covenant yourself to walking with the Lord as the ultimate priority of your life, will you commit yourself to a life of spiritual maturity in the Lord, a life of the pursuit of physical purity, and emotional purity? Me: I do so covenant with the Lord and Lawrance. Dad: Do you receive Lawrance as your God given husband, to accept him as a precious gift from God, to commit all that you are to the Lord and to Lawrance, to submit to him just as the church does to the Lord Jesus? Dad: Do you commit yourself to Lawrance to receive him and accept him just as he is. To remain sexually faithful to him, and to him alone. To abandon the pursuit of all others? Dad: Do you promise yourself to Lawrance, spiritually, physically, and emotionally, to cherish and to keep him, to meet his needs in sickness and in health until the Lord separates you through death or his return? After we answered these questions, we then made a profession of our covenant to each other in both English and Chinese. This is the part we borrowed from the Warnocks, and Lawrance translated them into Mandarin for us. What's interesting is that we both thought before the wedding that hearing the other speak our heart language was important. But, actually, hearing the other one speak their vows in their heart language was more important to each of us. I held it together while Lawrance made a commitment to me in English, but I totally lost it (ie. started crying) when he started to say the exact same words in Chinese. The same was true for Lawrance. Hearing me make my profession in English was more meaningful to him that hearing me speak it in Chinese. Although I cried through all the way through speaking in both languages. I, Amanda Nicole Parmley take you, Lawrance Aaron Wu to be my lawfully wedded husband. I promise, by God's grace, as He enables me to submit to you and to obey you in everything, as I do to the Lord. I recognize you as my head, even as Christ is the head of the church. In so doing I resolve to put my trust in God and not give way to fear. I will cultivate the beauty that comes from a gentle and quiet spirit knowing that this is of great value to God. I will speak the truth to you in Love. I will encourage you and strengthen you in your walk with God. I will not let the sun go down on my anger; instead I will be gracious to you, tender hearted, forgiving you even as God has forgiven me. I will trust in the Lord with all my heart and not depend on my own understanding; I will acknowledge Him in everything, knowing that He will direct our paths. I will follow Him wherever he leads us, putting the extension of his kingdom before all worldly possessions and pleasures. I will be peaceful, content and joyful in every situation we encounter knowing that He is at work for our good and that we can do all things through his strength. I acknowledge before the Lord my continuous need for his grace in my inability to do all these things, and rely on him alone for the power I need to live in a Godly way as your wife. Just beautiful! Thanks for sharing!! I stumbled across your beautiful story and just have to say that these are the most beautiful and God honoring vows I have ever heard. I am copying them for my husband who is a pastor if you don't mind. honoring grandparents In Chinese culture, respecting ancestors and elders is important. So, Lawrance wanted my grandparents to be an important part of our wedding. He wanted to find a way to honor them in our wedding. So, we asked my grandparents to read 1 John 4:7-21. PawPaw, my paternal grandfather read the first seven verses, and my maternal grandmother read the last seven verses. My maternal grandparents were married for over sixty years before my grandfather passed away. And my paternal grandparents have been married for over fifty years. What a blessing to hear two people I love and admire SO much--who all have and still do play a very important part in my life--read scripture about love at our wedding! i almost forgot the amens I almost forgot to mention that the whole time I was reading my vows to Lawrance he was talking back to me. He kept saying things like, "Amen," "Praise the Lord," and "Thank you, Jesus." I'm sure my dad heard, but I'm not sure anyone else did. It was so sweet. Kind of distracting . . . but very precious.